This Teacher's Resource Book includes a wide range of supplementary photocopiable material with answers, including complete extra lessons and case studies. 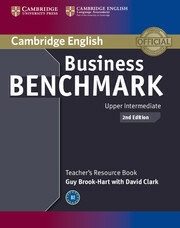 It provides information about how the activities in each unit relate to the Business Vantage exam and BULATS test. A complete answer key to both the Business Vantage and BULATS versions of the Student's Book is provided as well as complete transcripts of the listening material with answers underlined.